Long-lasting solution – Dental veneers can last as long as 10 to 15 years, with proper maintenance. Quick, simple procedure – Typically porcelain veneers can be completed in two visits. Stain-resistant – Porcelain veneers are resistant to staining, unlike natural teeth. You can maintain brilliant pearly whites, while still enjoying coffee, tea, and other products that normally cause staining of the teeth. Cosmetic – Porcelain veneers improve teeth that are cracked, chipped, broken, badly discoloured, widely spaced, or slightly misaligned. Improve confidence – An improved smile can help you feel more confident about your appearance, ultimately giving you a better quality of life. Dental veneers are a great way to dramatically and permanently improve the appearance, shape and colour of your teeth. They are usually used if you are looking to make significant changes to the colour, shape or position of your teeth. Veneers are made up of a very thin layer of tooth-coloured porcelain bonded over your own natural tooth to improve its aesthetics or to protect its damaged surface. 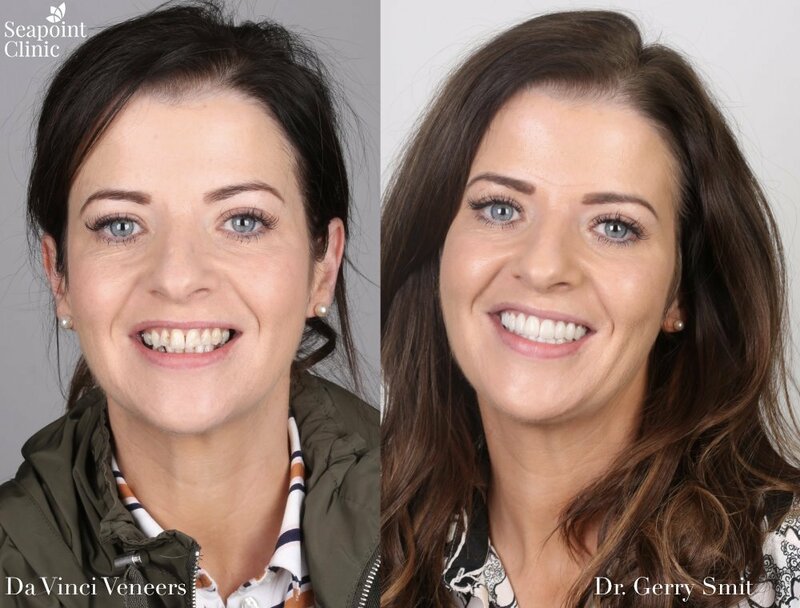 Because we only use veneers handcrafted by technicians in Da Vinci Studios, California, Seapoint Clinic is the premier choice in Ireland when it comes to getting a natural, beautiful smile. Here at Seapoint, we only use Da Vinci veneers are for those who are looking for the best results money can buy. These veneers are only made by Da Vinci in California by skilled cosmetic ceramic technicians. 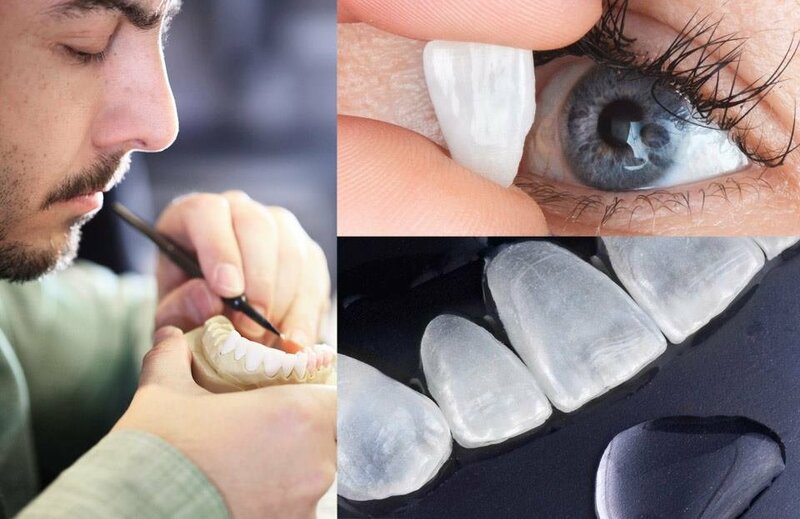 They combine science and art to produce beautiful life-like veneers. We have done veneers for many of Ireland’s top celebrities including Georgia Salpa, Sarah Morrissey and Pippa O’Connor. These people who need to look good for their jobs and trust Seapoint Clinic to give them the best possible results. 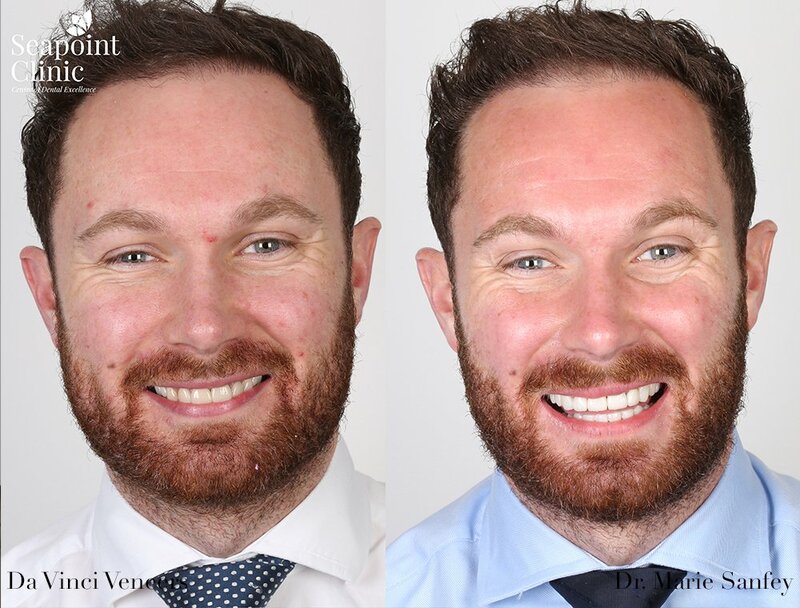 Before you get veneers we will normally arrange a smile simulation which will show you how your new smile is likely to look. We can modify this as needed until you are happy without ever touching your teeth. Once you are happy we get the simulation converted into porcelain in California before we bond them in place for you. Da Vinci veneers can be made in practically any shade you wish and can provide you with a beautiful smile to be proud of. As the largest provider of Da Vinci veneers in Ireland you can rest assured you will get the result you desire. Da Vinci also offer a lifetime guarantee against fracture of the veneers which is unique among dental laboratories. I'm delighted with how they turned out. Dr Sanfey was brilliant! "I highly recommend Seapoint Clinic, I'm delighted with the outcome!" We are all familiar with the unattractive black lines that show over time around some old crowns. This is caused by corrosion of the metal over time. It can lead to discolouration of the root of the tooth and even the gum itself. Ceramic crowns are different. They are made entirely from porcelain which means they will never corrode or cause dark lines to appear. Modern ceramic crowns have an ultra strong ceramic core which makes them just as strong as metal but without the unsightly metal. These teeth can look much more natural than crowns with metal in them as the metal colour does not need to be blocked out with opaque paints. This means the teeth can look much more lifelike and are indistinguishable from your own teeth. We also provide Instant Veneers, which is a non-invasive treatment that can be done in just one sitting. Otherwise known as composite veneers, they give fantastic results and requires minimal prep. Your veneers will look and feel exactly as you want. You can decide the shade and the look of your new smile and your dentist will make sure your new teeth will blend in with your new smile. Are veneers difficult to clean? You can clean and floss with your new veneers as you would with your own natural teeth. 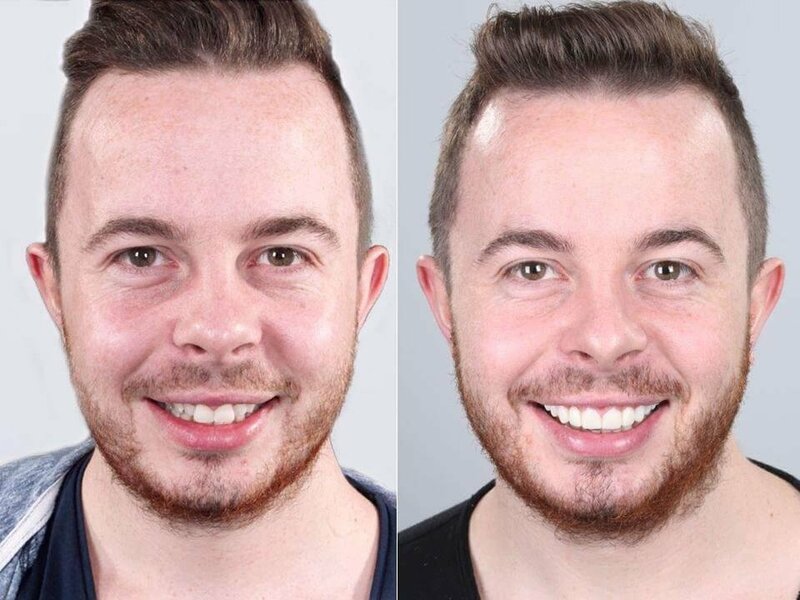 Can I remove my veneers? Your veneers are a permanent fixture onto your teeth. They have the potential to last a lifetime but are usually replaced every 10-15 years to keep your smile sparkling. What veneers do you use at Seapoint Clinic? Can veneers be used to replace missing teeth? No. Dental implants are used to replace missing teeth. A veneer acts like a false nail and sits on top of your own natural tooth and does not have a tooth root. Why are veneers & crowns so expensive? Will I have sensitivity from veneers?